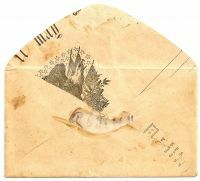 Description: CSA stampless Advertising Cameo cover postmarked CHARLESTON, S.C., OCT 29, 1861 with matching PAID 5 in circle sent to Greensboro, NC. Description: CSA #7 pair on turned cover postmarked CHARLESTON, S.C., FEB 18, 1863 sent to Darlington, SC. 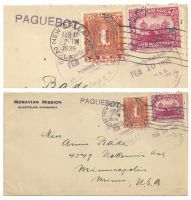 Description: CSA stampless manuscript "Hamptonville, NC, Mar 17th" and "Pd 10" on turned cover sent to Thomasvile, NC. Description: CSA #11 on leaf wallpaper cover postmarked SPARTANBURG C.H., S.C., sent to Greenville, Court House, SC. Description: CSA #11 on cover fashioned from a bank document postmarked COLUMBIA, S.C., sent to Yorkville, SC. Description: Captured US Patriotic cover postmarked RED CLAY, Ga., JAN 18 with DUE 10 manuscript rate sent to Deals Mills, NC. 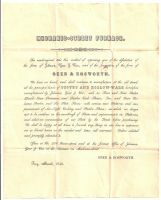 Description: CSA #12 on hand-drawn Confederate Battle Flag Patriotic cover postmarked MOBILE, ALA and sent to Buickville, Ala. Description: Confederate use of US #26 stamp on 7 Star CSA Flag Patriotic cover postmarked CHARLESTON, S.C., MAY 12, 1861 sent to Glenn Springs, So. Ca. Description: US #94 on postwar Confederate Imprinted cover postmarked SALEM, N.C., FEB 17 used locally in Salem, NC. 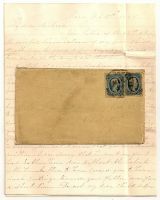 Description: CSA #7 pair on US U10 Confederate Official Imprinted cover sent to Warrenton, North Carolina. Description: 6XU5b stampless ATLANTA, GEO. PAID 5 handstamped provisional under CSA #1 General Issue stamp postmarked ATLANTA, Ga., MAR 30, 1862. Description: CSA 16X1 on cover postmarked CHARLESTON, S.C., JUNE 19, 1862 and sent to Pleasant Lane, SC. Description: CSA 16XU2Â entire postmarked CHARLESTON S.C., NOV, 25, 1861 sent to Jacksonville, Fla. Description: SFL sent by a school teacher in Hamburg, SC, to family in Lower Canada. 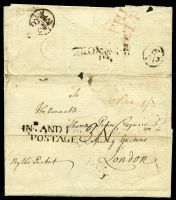 Description: Advertising cover for dealer in Stamps and Coins with red ad collar around 2c red Washington. Omaha Nebraska to Milwaukee Wisconsin, !909. Description: 1850's 3 cent red postal entire manuscript cancelled with matching FORT HEMBREE, NC, FEB 16 postmark sent to Garner's Ford, NC.